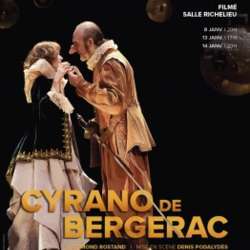 Cyrano is afflicted with a prominent nose but endowed with the words by which he helps the handsome Christian to conquer Roxane. Also in love with the girl, he chooses not to reveal to her that every word of Christian comes out of his own heart. "When, actors of the Troupe, we assemble pieces, we unconsciously desire to show our theater, all that makes us love and stay there. It is in this spirit that Denis Podalydès seized the plateau of the Salle Richelieu. Opera-food, tragedy, romantic drama, symbolist poetry, farce ... all genres are convened to vibrate the score of this text emblematic of the French repertoire!